The Instagram account of Argentinian photojournalist Jorge Saenz, based in Paraguay, has taken off in a big way due to his fantastic knack of capturing realistic and dramatic images with his bag of toy dinosaurs. 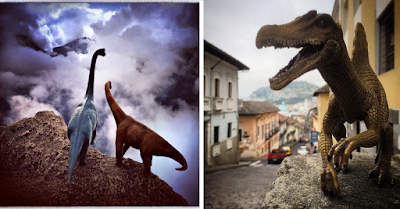 The photo captions are written from the dinosaurs’ perspective as Jorge has given each of them a name and distinct personality. “Dina (the big green Stegosaurus) is more aggressive and instinctive; Spiny (Spinosaurus) is mostly ironic; Brachy (a brown Brachiosaurus) is the romantic girlfriend of Dino, but very critical of male behaviour,” he says. The images crop up all over the place, in the lagoon (garden pond) on mountains (a few small rocks) down a back street, in the shower. They are causing quite a stir on Instagram, with many faithful followers. The full collection has been tagged as #dinodinaseries.